Boutique, Handwired JTM45For purists that want only the best - we present you the handwired boutique Marshall 2245THW. Based on the 1962 JT..
For purists that want only the best - we present you the handwired boutique Marshall 2245THW. 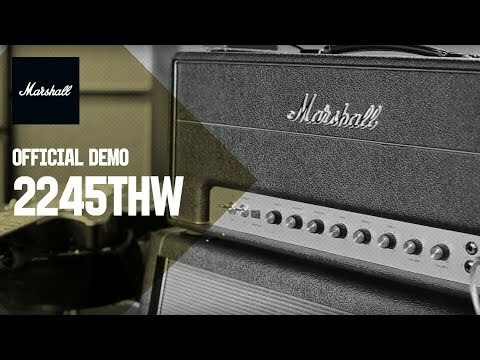 Based on the 1962 JTM45 Bluesbreaker that was used by legends such as Clapton, Hendrix and Townshend, this 30 Watt guitar head is perfect for studio and stage use. It has a built-in tremolo effect to get that authentic 60s vibe sound - the Marshall 2245THW is every bit as good as the original. Match this up with a 4x12 such as the 1960AHW and experience pure blues/rock heaven. The all-valve 2245THW is a hand soldered re-issue of the extremely rare ‘Bluesbreaker’ head, based on the archetypal JTM45 head, which was the amp that began it all back in 1962. As you would expect, the specifications for the 2245THW are identical to the 1962HW ‘Bluesbreaker’ combo, minus the speakers of course. Inside the 2245THW the valve set is four ECC83, with two KT66 in the power stage and a GZ34 rectifier. It’s the GZ34 rectifier that helps create the sublime output stage compression and clean sustain associated with the ‘Bluesbreaker’ head. To make the 2245HW as authentic as possible, we have used original thickness, original pitch matrix, point to point tag boards. As with the ‘Bluesbreaker’ combo, the 2245THW now features valve Tremolo.